Nature has provided every creature that roams the earth a diet designed to sustain and maximize its life. What these diets are composed of is based on a creature’s location, climate, accessibility, and physical prowess. As humans, our ancient forefathers—and mothers—were raised and nourished in the same manner as the beasts that surrounded them. These Stone Age diets, now called Paleo diets, reflect the types of foods that nature intended us to eat. Unfortunately, we have lost touch with how nature intended us to live and mistakenly think we can eat anything sitting on our supermarket shelves. Paleo in a Nutshell is an eye-opening guide to restoring our health by eating the foods for which our bodies are designed to consume. 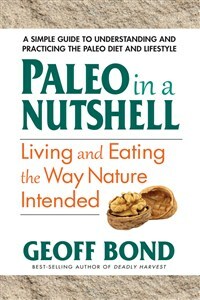 Author Geoff Bond is a world-renowned scientist who has extensively researched forager societies of the past and present. What he has discovered is that our hunter-gatherer ancestors had never experienced the health disorders that plague us today. This is because their diets, environments, and daily activities were far more in touch with their bodies than our way of life today. Although our diet has become our most dysfunctional feature, other aspects of the Paleo lifestyle are essential to explore as well. In Part One of this book, we learn how and why our ancestors thrived and explore how things went wrong when we stopped behaving in agreement with our evolutionary past. In Part Two, we are provided with an “Owner’s Manual”—a guide to appropriate and healthy foods with which to fuel our bodies—and a step-by-step plan for implementing this way of eating. While you may no longer have time to hunt and forage for your food, this book offers modern and simple substitutions for you to use, as well as several delicious recipes. Written in simple-to-understand language, Paleo in a Nutshell is all you need to find your way back to a healthier and more natural way of living. Geoff Bond graduated with honors in applied sciences from London University. He spent his early career living and working in remote African villages, where he widened his studies in anthropology, biochemistry, and evolutionary human development. Using both research and firsthand observation of tribal societies, Bond developed guidelines for living in harmony with our naturally adapted lifestyle. He is the author of Deadly Harvest and Natural Eating and, with his wife, Nicole, the coauthor of Paleo Harvest.